With the Coalition’s change of leadership and its impact on the electorate, the prospect of Bill Shorten’s imputation credit proposal becoming law appears more likely. Originally aimed at the “big end of town”, it is important for investors to understand whether they are affected by this proposal. Since the original announcement in March by the Australian Labor Party to scrap imputation credit cash refunds, a concession to pensioners and to some self-managed superannuation funds (SMSFs) has been announced. The concessions allow for the cash payment of surplus imputation credits to continue for those on the age pension or allowances, or for an SMSF with a member receiving age pension, as at March 28, 2018. While this concession may lead to some SMSFs thinking about recruiting a new member who is in receipt of an age pension to the fund, I would suggest SMSF trustees first consider the potential estate planning fallout from adding new members to their fund before proceeding. The group most exposed to Shorten’s attack are self-funded retirees and SMSFs, particularly those in pension phase. A perverse outcome of the proposal is that high income earners and ultra wealthy individuals are likely to be largely unaffected, leaving middle-class retirees bearing the brunt. High-profile fund manager Geoff Wilson believes “investors should not give up the fight”. “If Labor wins government at the next election, it may either realise the error of its ways due to public protest and abandon this flawed policy, or have it blocked in the Senate,” he adds. So it would be wise to “hasten slowly” before making changes to investment portfolios in response to this proposal. That said, investors should begin thinking about how they may react if the proposal is legislated. First, investors need to quantify the magnitude of the potential change on an asset by asset basis. 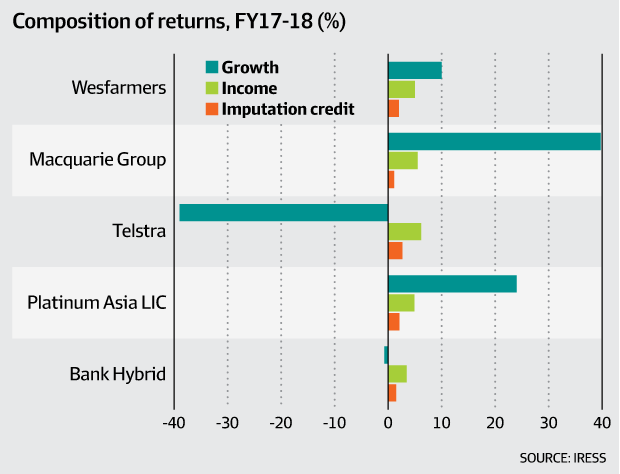 To illustrate this, the accompanying graphic shows the total shareholder return of selected Australian securities over the last financial year, dissected into growth, income and imputation credits. Bank hybrids, which have become a retail investor favourite, should be reviewed because a material component of the return consists of the imputation credit. Rather than focusing just on tax, however, bank hybrids should be reviewed in light of the ALP’s proposed changes to negative gearing and its likely impact on the residential property market and, by extension, bank earnings. Investors in listed investment companies should not panic. In our conversations with management of listed investment companies, it is clear they are already considering their own plan b which might involve a change in legal structure to protect investors from any fallout of the ALP proposal. Investment managers investing in global shares are one of the beneficiaries from a removal of imputation credit cash refunds. Well-known names such as Magellan, Montgomery Investment Management and Platinum Asset Management are likely to attract investors into their ASX-listed investment trusts that pay unfranked income alongside solid long-term performance. So it’s time to plan now, and act later, unless investors wish to take up Wilson’s call and take part in online petitions such as those being conducted by Wilson Asset Management and Plato Asset Management. General advice only. Mark Draper is a financial adviser with GEM Capital Financial Advice.